I love seeing how people create recipes out of a sense of health purpose. In my kitchen, a recipe has to be gastronomically delicious, but equally the foods used has to be selected and prepared in a special way so the molecules do something phenomenally healthy for my body. So here is how the story goes for this recipe. This past Easter I spent the holiday with my sister, Suzanne Johnson, and her family enjoying Cod Cakes. Her husband, Roland Johnson (also a NOLA native) went through his annual wellness checkup and was told to add more omega 3’s into his diet. He came home and discussed this with my sister. Thinking like a true New Orleanian, he conjured up in his mind to use Cod, an omega 3-rich food, in crab boil. 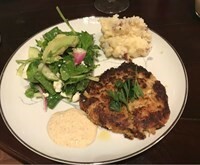 From that point, my sister “raised the bar” due to her love of cooking and preparing super healthy food and created Cod Cakes. She shared her recipe. But I didn’t stop here. I took this recipe and added my own Food as Medicine twist to create a Happy Gut F.A.M.E. meal for my Dorignac’s family. So far my four taste testers gave this meal an 11 on a scale of 1 (bad) -10 (excellent). For starters, I added a spicy Kimchi into the Remoulade sauce and sheep yogurt to the Happy Microbiome Red Whipped Potatoes to help seed our microbiome. I am delighted that the rich source of omega-3 from Cod, which tastes like crab, will pump up the cells in our gut firewall. The Zinc in the Cashews and the amino acid glutamine in the cashews, seafood and cabbage will seal up any holes in our firewall. The resistant starch found in the slightly cooled Happy Microbiome whipped red potatoes will bypass your small intestine and feed your microbiome. Your microbiome will chomp down on the resistant starch and fibers from potato skin and vegetable fibers from the salad and create short chain fatty acids. These short chain fatty acids will be absorbed by the colonic cells and that is where the metabolic magic of the feeding your microbiome has been to shown to lower overall insulin response, lower cholesterol, lower triglycerides, increase satiety and reduce body fat. To build on what we already know from some of my recent blogs about 21st century nutrition, I applied the principles of using Mediterranean diet and superfoods: fennel, onion, garlic, broccoli and cabbage to activate the NRF2 gene to provide a fire hose of antioxidants inside your cells. And remember when you activate NRF2 gene you tap down the NF-kB to turn down the inflammation. Plus, you added omega 3’s and EVOO to further tap down the inflammation. Nice job meal! I’d love to hear your reviews. Bon appetite. We will be serving this recipe at Customer Appreciation Week in October. Come enjoy and meet me at the store on Friday, October 5th from 2:00 – 4:00PM. Bring pot of water to boil and add frozen cod. Reduce and simmer until cod is cooked. Drain and flake with a fork. Sauté onion and garlic in olive oil until onion is translucent. Add remaining ingredients, including cod. Form into patties. You can freeze these for later use. They tend to pan fry easily from freezer to pan. Lightly heat EVOO and pan fry each side 3 minutes. Serve hot. Grate horseradish root and lemon for zest. Place all ingredients in a food processor and lightly pulse until blended in a creamy sauce. Stage preparation of these potatoes 15 minutes prior to eating so that they cool to below 120. Rub potatoes with olive oil and sea salt for 45 minutes in convection oven. Remove and mash. Add yogurt, ghee, cracked black better and sea salt to taste. Allow to cool below 140 to allow the greatest Resistance Starch. Rub potatoes with olive oil and sea salt for 45 minutes in convection oven. Add yogurt, ghee, cracked black better and sea salt to taste. Allow to cool below 140 to allow the greatest Resistance Starch. Add all ingredients and toss in Bragg's Organic Vinaigrette and extra virgin olive oil. I can’t wait to make these recipes. Thanks for sharing….